Offering free hosting with a 99.9% uptime guarantee, few solutions do as well as Wix when it comes to helping newcomers get online. Thanks to the company’s drag-and-drop website building tools, anyone can build a customized website without any prior web development experience. Wix provides beautiful templates for every variety of website, allowing you to add video, images, shopping carts and many other useful features. If you’re more technologically advanced, you’ll find a lot of the hottest features in web design on Wix, such as HTML5 and SEO integration. Whether you're planning to sell products through an online store or want to showcase your service-oriented business with impressive images, Wix could likely offer everything you’ll need. Wix offers simple drag-and-drop features so you can quickly customize design elements, edit content, tweak templates and modify images to tailor your website to your taste. You can easily change colors, backgrounds, fonts and images without using any code. For more tech-savvy users, Wix also supports HTML5 across many browsers and mobile devices. HTML5 interface can give you access to more functionality and features, as well as improved storage, accessibility and overall usability. In other words, no matter how experienced you are, Wix seems to have a solution that’s perfect for you. Wix seems to have templates for any conceivable business, occupation or interest. Since Wix doesn’t charge for templates, you’ll have free reign to choose any one you want. Simply click on any element you want to change, and a pop-up menu will show you how to modify an image, background, text box or any other design element. In just seconds, you can move menus, add pages, change backgrounds, select font styles and add social media buttons. Once you’re ready, you can instantly preview your website to see how it will appear in a browser. 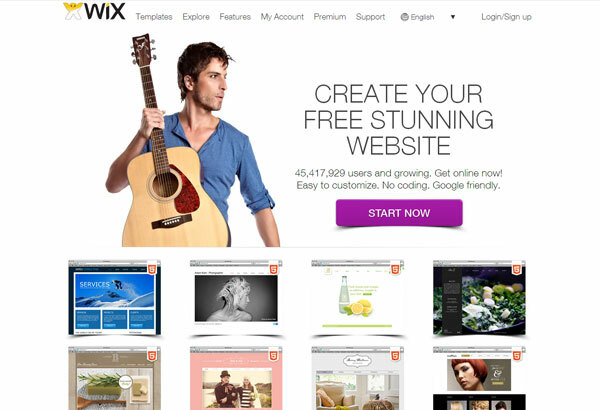 As if offering free, professionally designed templates wasn’t enough, Wix offers 100% free Top Grade Hosting to its customers. With a 99.9% uptime guarantee, Wix Grid hosting provides uninterrupted service that ensures the availability of your website, as well as the accessibility of your products and services. If you find that your website has outgrown the limits of the company’s free hosting, you can easily upgrade to one of Wix’s inexpensive premium packages for increased bandwidth and storage. Additionally, most of Wix’s subscription package are completely adfree, providing an even better experience for your visitors. Building your website may be easier than you expected using Wix, but marketing your website could be even easier. By selecting the “allow search engines to find my site” option, you’ll instantly index your website, meaning you’ve taken your first step toward ranking in popular search engines. Wix recommends several additional steps you can take for your site’s SEO, which could help you potentially turn new visitors into customers. You also have several effective marketing methods at your disposal, such as useful social media integration. Wix’s support resource center is full of helpful video tutorials that can walk you through every facet of the Wix website building experience. You can search through numerous support topics to research concepts and procedures, or simply type your topic in the search box. The FAQ database is staggering in its breadth, covering almost every conceivable website building topic. In case you need assistance for a very specific situation, Wix offers additional help in its support forum. Follow a few short data-gathering screens to refine your question, and submit a query to Wix’s experienced support staff. Premium support is available for VIP package subscribers, which provides users with unparalleled customer support access. In addition to its free hosting, Wix provides a 14-day money-back guarantee and a discount for 1-year pricing plans on its various package levels. All premium packages include premium support, the ability to connect an existing domain and Google analytics. Connect Domain – $4.08/month for 500 MB storage and 1 GB bandwidth. Combo - $8.25/month for 3 GB storage, 2 GB bandwidth, Favicon and no Wix ads or mobile ads. Unlimited - $12.42/month for 10 GB storage, unlimited bandwidth, Favicon and no Wix ads or mobile ads. Ecommerce - $16.17/month for 20 GB storage, 10 GB bandwidth, shopping cart, Favicon and no Wix ads or mobile ads. VIP - $24.90/month for 20 GB storage, unlimited bandwidth, shopping cart, Favicon, VIP support, priority call back, instant response, professional site review and no Wix ads or mobile ads. Wix is a solid service for both personal and professional purposes, providing a simplified product that doesn’t require a lot of money, time or design experience. In fact, you can quickly and freely build a professional-looking site thanks to Wix’s impressive, straightforward drag-and-drop interface. 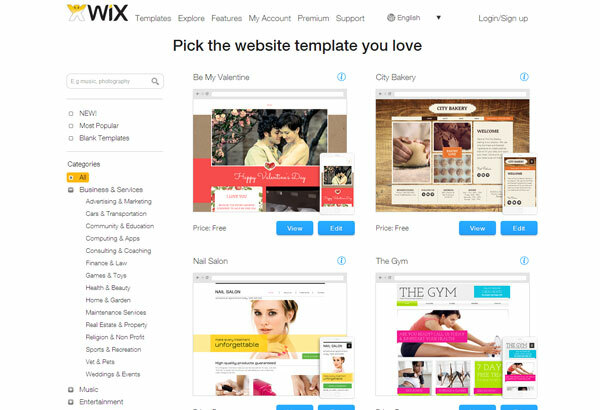 Wix caters to the needs of small- and medium-sized businesses, offering dazzling templates that are easy to customize. Providing free hosting to ensure lower overhead, as well as teaching marketing techniques that are designed to drive traffic to your site, Wix really lends a hand to the little guy. Whether you’re looking to increase your business’s online presence or just seeking exposure for a pet project, Wix could help take your endeavor to the next level.